I am using dotnet core 2.1 RC, so I don’t need to install any packages to run dotnet ef command. It is pre-installed as a global tool when we install the SDK. This command will generate DictionaryDbContext.cs under Data folder, which the DbContext class. And all the POCO classes under Models folder, since I have only one table, it generates the Definitions.cs. Next I implemented the search in the Dictionary database with DbContext and POCO classes. As part of enhancement, I wanted to implement an user registration and authentication. 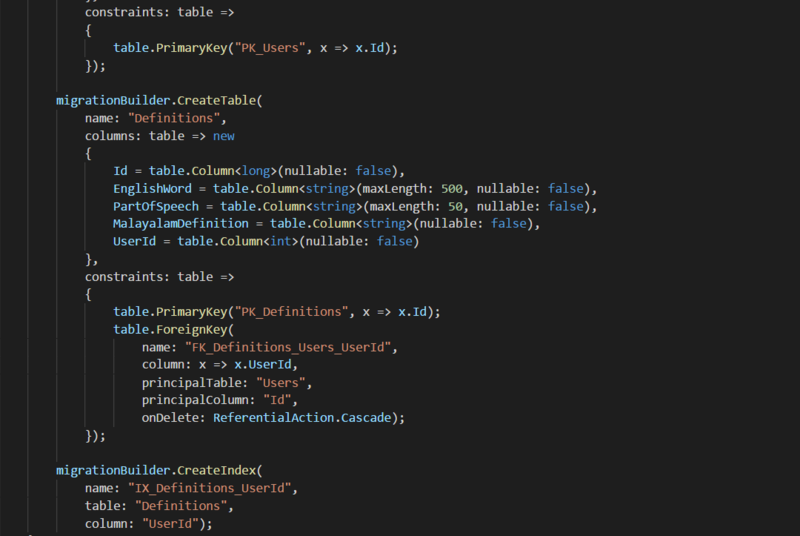 Since I don’t have a users table, I created the table and added the Foreign Key in the definitions table like this. And here is the user table. Now to create the user table in the Database, I am using EF Core migrations. So I modified the project to use EF Core, like this. Removed the OnConfiguring method from DbContext class. Added two empty constructors - without this, EF migrations will not work. Added a property in DbContext class for users table. Here is the Updated DbContext class. Moved the connection string to appsettings.json. Added the following code in ConfigureServices method to inject the DbContext to controllers. Here is the updated ConfigureServices method. Next you need to run the migrations command to generate the migration code. This command will create a Migrations folder, with C# code inside to build the users table. But the problem is this will also create script to generate definitions table as well, which we don’t require. So we can’t use the EF Code first approach directly, instead we need to use a hybrid approach, we require code to build Users table and the Foreign Keys. But we already got some data in definitions table, so we don’t want to create it again. And without data in users table, I can’t create a foreign key, so we may need to seed the users table as well, when I am running the database update command. So I am modifying the code like this. In the above code, I am creating the users table, then seeding it with one record, so that I can create a foreign key with definitions table. Also I using a HashPassword method to hash the password while seeding the database. Now you can run the dotnet ef database update command to create the database. You will be able to see, the database update created the table, updated the tables and did the initial seeding. In this way you can use EF Core in a hybrid way, where you are starting development with Database first approach, later changing to code first approach and finally using both together.